The bright star Sirius and its smaller companion may have a lesson to teach mainstream astronomers, who have yet to learn of electricity’s power in the cosmos. From Earth, as seen by human eyes, the star Sirius is the brightest star in the sky. This is partly because it is brighter than the average star, but also because it is one of the closest stars to Earth. Sirius also has a partner, called Sirius B, a tiny white dwarf. To our eyes, it is 10,000 times fainter than the primary star, Sirius A. The companion was discovered in the mid-nineteenth century by the wobble it caused in Sirius A’s path across the sky. It wasn’t actually seen until decades later, when newer and better telescopes were invented. The Chandra orbiting telescope observes x-ray light, which is invisible to the human eye. When astronomers pointed Chandra at Sirius, they were surprised. In the Chandra image above, the primary star, Sirius A, is the smaller of the two lights. Sirius B, the tiny white dwarf, is the larger. This means that if we had Superman’s x-ray vision, we would see the reverse of what we see with human eyes. Why is Sirius B so bright in x-ray light? Astronomers explain the anomaly in terms of gravity. 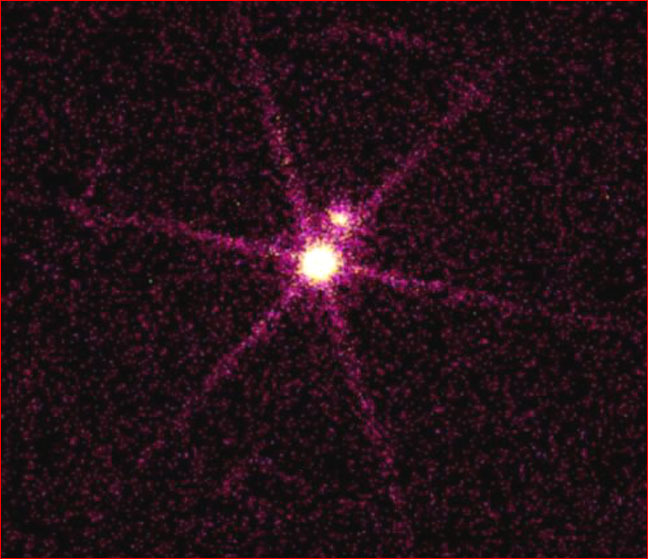 Particles from Sirius A fall onto Sirius B so fast that the collisions create the x-rays. The Electric Universe provides a different explanation. X-rays are not caused by “falling” particles. Charged particles don’t care about gravity! And nature abhors inefficiency. Just as your dentist uses electric currents, not gravity, to generate x-rays, so do electrically driven stars. There’s another problem with binary (double) stars. Why are there so many of them? Stars are so far apart that even if galaxies collide, the stars will mostly slip past each other unnoticed. Yet in our stellar neighborhood, about half of the stars come in twos. Electrically speaking, there are at least two possible explanations. The first is that the currents of space (and the plasma lab) tend to run in braided pairs. Where these braided currents become pinched by their own magnetic field, a star will be formed in each of the two braided currents. Don Scott, a retired professor of electrical engineering and an amateur astronomer, has suggested a second method for the formation of double stars. Scott was studying the Hertzsprung-Russell diagram (HR diagram) that astronomers use to classify stars. The diagram plots the luminosities of stars against their temperatures (or colors—blue stars are hotter and red stars are cooler than our sun, which is a yellow star). Scott found that he could also substitute electric charge for temperature on the same chart (the higher the electric charge, the bluer and hotter the star). He suggests that when the charge gets so high that the surface of the star can no longer resist the electrical stress, the star will split into two stars in order to distribute the stress over a larger surface. The possibility of electrical "splitting or parturition" of cosmic bodies was first proposed by Eric Crew of the UK in 1977 and elaborated further in 1985. Crew was a student of a pioneer of the electrical view of the cosmos—the electrical engineer and Fellow of the Royal Astronomical Society—Dr. Charles Bruce. The generation of internal electrical stress inside stars gained further elucidation by Wallace Thornhill. This hypothesis would also explain why stars that have suffered the greatest electrical stresses—the novas and supernovas—are almost always found to be double, or even multiple, stars. Though astronomers acknowledge the pattern, they have not explained it. But if stars are formed and continually fed by electric currents, then what we have learned from the laboratory study of plasma and electric discharge should be our first reference in seeking to understand possible analogs in space. The dynamics of electrical ejection can also be applied closer to home. Wallace Thornhill was able to accurately predict what would be found beneath the clouds of Saturn's moon, Titan. He did this by working with the hypothesis that Titan and other identifiable bodies in the solar system had been ejected at intervals in the past by the gas giant.